November 15, 2018 - The digital marketer's #1 daily briefing! Is there nobody you can trust these days? Must be how Mark feels after over 50 people talked to The New York Times and gave away all the dirty secrets on how Facebook handled all the scandals. Andrew Payne reveals everything he learned after running 7+ figures of push traffic in 2018 and Mo gives us some conversion tips! The dark side of Facebook that Mark & Sheryl wanted to stay hidden forever! Facebook’s strategy after their election scandal: delay, deny, deflect! The New York Times turned the lights on the dark side of what they call the Facebook Crisis – it includes the Cambridge Analytica scandal. 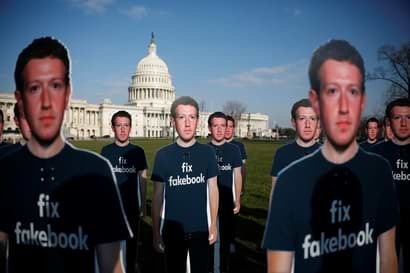 More than 50 people’s insider information – current and former Facebook executives, lawmakers and government officials, lobbyists and congressional staff members – all revealed! The news piece highlights many of the underground strategies that Mark, Sheryl and other Facebook execs used to handle the biggest crisis in the company’s history. A hidden side of Facebook that is a must read. Grab a cup of coffee, get comfy in your favourite chair and get reading! Do you want Facebook to work for you? For free? Then you should follow Lotfi Drif’s advice on why Facebook Offers work so well. – Free email follow-up from Facebook: they will literally email your prospect reminding them to use your offer. Plus, the message is sent to their best email. Delivered for sure! – Free notifications: Facebook sends prospects many notifications to remind them to buy your offer. Doesn’t it look like free retargeting? – Your offer is permanently saved in the prospect’s ‘Saved’ folder. Plus, it will always remain ‘unread’ until they go through with it. Not only, but it will also be in the SAME group as all their non-advertising saved posts. – The best part of all, users only have to click on “Get Offer” once to have all this magic happen. No filling out a form, no messenger opt-in. Can it get better? Yes. Facebook doesn’t charge you per “Get Offer“ click. – It doesn’t look like the usual ad. It comes up as ‘Your Page Name shared an offer’ and it also shows how many people claimed it. Free social proof boost for your ads. To enable this you just have to toggle the Offer button when you create a conversion or link click ad. Honestly, this post is so good we didn’t want to share it with you. Just kidding! Of course we’ll always share the best posts we find! You know Andrew, right? He’s someone we’ve interviewed and featured before. And one of the best push traffic affiliates out there. We got his main takeaways for push after he focused on that traffic type this year. Badge: thoroughly tested and even the best one was so marginal it’s hard to tell the real performance impact. I default mine to a message icon or get creative but don’t waste a lot of time. Image: in most cases, the users will never open the dropdown on their Android to look at this image, while there have been some cases on mobile that this has helped it is mostly a benefit of windows desktop push. Don’t waste time looking for tips on how to run push, jump in now and figure things out on your own because by the time you learn all the shared tips I will have drained every push users wallet you’ll be too late. Headline and Icon are the biggest influencers by far! Different message copy will perform differently and the time of day has a difference especially for some offers. Having a proven lander/offer combination from the beginning will definitely be a huge leap forward. You will have issues with burnout if you are just hammering 1-2-3 offers and messages. You need to have a series of offers/messages/icons in constant rotation to slow down fatigue. But it will eventually happen once you or all competitors have exhausted the audience. Tip – Just keep the creatives and messages shocking, think more like native banner ads. Some ad networks are just way overpriced and have no clue they are doing. Keep in mind that not only this format of ads is new for you. It’s also new for them. They are willing to sell inventory especially in the lower tier countries where it’s not easy to make ROI positive campaigns. Thus, get a rep and negotiate. A small test does not determine the true results. For lower payout offers, you can run a small test. For higher payout offers you need to run a big test or do several smaller tests in one day, like 2-3 times. Paying more does not affect the quality of the traffic/users. All push users are real users, some ad networks favour certain types of traffic aka streaming, adult, etc. So keep that in mind with your offer ideas when promoting on those networks. And pay the cheapest you can so you don’t waste money. Getting a high CTR DOES NOT mean success in most cases. High CTR messages with low focus = No results = high CPC costs = you lose. For simple conversion flows like lead gen, you can test broad high CTR geared messages. But the results will be inconsistent, sometimes good and sometimes bad. Instead, focus on tailored messages that offer and pre-qualify the users. It will result in lower opens (lower costs on a CPC basis too) but higher CR and more often than not you can make it work well. This is very short lived boasting. What I mean is, they will plateau on their new user acquisition and that growth will no longer happen. It will simply sustain the current level of churn they are getting from all the messages going out daily. And for the ad networks who do not properly manage their user base, they will actually be losing more users than they acquire. Be careful of these networks because you will find it hard to make campaigns work at some point due to all the advertisers and the users being overly exhausted. Your alarm clock? The fear your landing pages got flagged? Worrying about your campaigns? Your legs? Or one thing to look forward each day? Research shows that the latter would be the best way to wake up. Positive experiences can improve your mental and physical health. We know that exercise, spending time with friends and music can positively influence your well being. The same is true for positive emotions in general. Your attitude can make a major difference in your life. In fact, research has revealed that even anticipating positive experiences can improve your health. Even just anticipating watching a favourite comedy video increases your levels of endorphins and growth hormones. At the same time, it reduces the stress hormone cortisol significantly. With all of the stress factors in the world, why not do yourself a favour by implementing these research results? Start your day by thinking of one thing you can look forward to, every day! Start visualizing that 400% ROI and you will immediately jump out of bed! Do you have people dropping off at your checkout page, right before converting? Mo Ali Aguel posted a great tip on how to increase your conversions on your checkout page in his Momentum Marketing Tribe Facebook group. Give people something else for free when you sell physical products and a lot of people will “buy” the free gift, not the actual product. But what kind of gift? Easy. Digital products. You are selling fitness products/clothing? Offer them a How to get a Six-Pack ebook. Get it? Don’t forget to put a price on that ebook! People will get a $49 ebook for free if they buy the physical product, they won’t get a free ebook. This is a key point! But how to get a digital product that fits your physical product? You can buy private label ebooks and rebrand them or you can pay someone to write you an ebook. Check out the full post with more examples of digital products and detailed instructions on how to make an ebook! The WTAFF Crew on behalf of our readers says: Mo, hats off to you! You probably know that 2 weeks ago, on October 30th, Google Ads started requiring Parallel Tracking. What is this you might ask? Well, Parallel Tracking was implemented to speed up load times. Instead of the long-time standard process of loading a tracking URL (to capture valuable insight data) and then redirecting to the Adwords click tracker before the landing page, Parallel Tracking sends the visitor straight to the final landing page while tracking loads in the background. Not a ThriveTracker user yet? Why not give them a try! You can check the live demo right here. And if you get started, ThriveTracker has super-convenient cloud-hosted plans starting as low as $79/mo, allowing users to track up to 1 million clicks on the base plan. But that’s only after a 14-day, no-cost trial period where you can test all this out. Did we mention they’re going to provide you with a free VIP Onboarding Session with one of their Platform Geniuses as well? That’s a $249 value – all you need to do is use the code WTAFF50 when you create your account and these savings can be yours! After having that AI replace a news anchor, now we have an Amazon Echo called as a witness in a double murder case.